Now completely done with cities, we decided to head for the beach. Well, maybe we’d hit just one more old city along the way – Toledo was supposed to be pretty impressive, the whole old city being a World Heritage Site – so we’d just stop there for a bit. It’s an ancient city influenced by all of the cultures who have held sway in Spain – the Romans, the Visigoths, the Moors and the Spanish. After finding parking and deciding that despite information in our guide to the contrary, that parking lot wasn’t a great place to spend the night, we headed up the five escalators into the city on top of a hill. We pretty much just wandered about the city for a bit, finding tourist info and then wandering a bit more and then back again. We saw a lot of the place, and a lot of Korean bus tourists, but didn’t go in anywhere. We were so done with old cities that we didn’t even check out the castle, which had been rebuilt last century anyway, after a dramatic siege during the civil war. We found an amazing marzipan store – they had recreated the cathedral and Don Quixote in marzipan. Bought a couple small ones to try and continued to wander. You can’t see it well in this picture, but there’s a zipline strung across the river – the kids were fascinated and almost, almost wanted to try it. They decided against it in the end, which I was secretly pretty relieved about. As it got dark, we decided to have dinner there and looked for a place – our cheapness led us to a place with €9 and €11 menus, and we had an OK but not great dinner. Back in the van, we headed for a motorhome parking about an hour away. The problem with these motorhome camping places is that you’re supposed to be fully self-contained. We almost are, and could be completely, if we ever filled up the little porta-potty that has been riding around in the van since we bought it. We even have the proper chemicals. But we’ve never been committed enough to free camping for so long to actually fill it up and get over the squickyness issue. So, mostly, the places we’ve done this have been pretty deserted and have had somewhere one can pee surreptitiously. Not this place. Along a main road, and not a hidden corner to be found anywhere. Luckily I’d gone not too long ago and managed to hold it in until we went shopping at the Lidl in the morning. But we spent the night for free, and doing it this way usually means we get going pretty quickly in the morning. This morning we needed it. We decided to take a non-highway road to the coast, and had a lovely day of it. 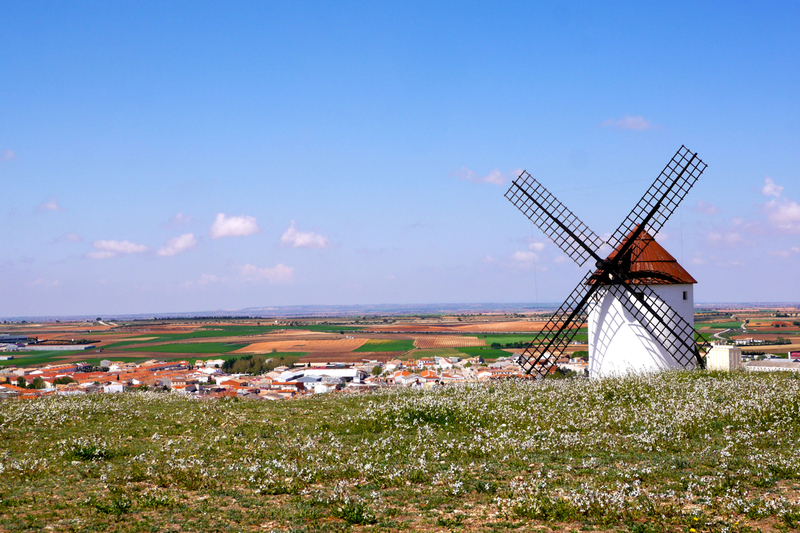 We passed through the least touristy area of Spain and found some windmills to have lunch by (part of the area’s attempt to lure tourists with a Don Quixote Route). We managed to skip another touristy old World Heritage Site city that we passed right by (Cuenca) and headed through some lovely mountains, the landscape varying from interior British Columbia to Southern California and even some American Southwest as we neared Tureon. A nice day of road trip driving – it would be a very fun road on a motorcycle too. As we approached the coast though, I couldn’t quite give up on the seeing old things thing and suggested we head for a restored Roman amphitheatre in Sagunto, where apparently some Romans had withstood a 9-month siege by Hannibal before burning themselves and the city rather than surrendering – the Roman army relieved them rather too late and then rebuilt. The GPS confidently said it would take us there, and started to send us up the steep hill along narrow residential streets. Although I protested when we first turned off the main road, Ivo was driving and couldn’t see a way out so he started up, thinking it would get better. I got increasingly nervous as we squeezed between parked cars with barely any room to spare. We started to really panic a bit when we reached a Y intersection where the way down would take us by protruding balconies that I wasn’t sure our high top van would clear and the way up was a dead end. The Street View shot doesn’t show the sign, but this is where it was. We took the dead end, hoping for a place to turn around. As we approached an intersection that looked promising for a turn around a Spanish lady came over. We sheepishly admitted that we had followed bad instructions from the GPS and she told us that it happened so often that her husband had actually learned English and had maps from the tourist info to tell people where they should be going. She explained how we should turn around, but then also told us to be careful making the sharp turn back down the hill, as one time someone had tipped over and the ambulance had had to come and it was a big mess. This, of course, did wonders for my confidence, since being the better driver, especially on hills with a stick shift (Dutchie vs British Columbian), it fell to me to get us out. But I did it, and I navigated back down the hill without incident and made it to place we could park to head up to the theatre. Then the stress hit and I just sat there coming down. At that point, seeing as K was still asleep (she’d fallen asleep on the highway and slept through the whole incident) and L was less than enthused about another old place, despite having just studied the Romans, we decided to f**k it, and not walk up the hill to see the amphitheatre, even after all that (avoiding the sunk cost fallacy). Taking deep breaths, we headed out to a super-European-style campground that has the benefit of a heated pool and direct beach access. Time for some rest and relaxation.